Hi friends! Better day today for me and I'm getting my post done earlier...yay! 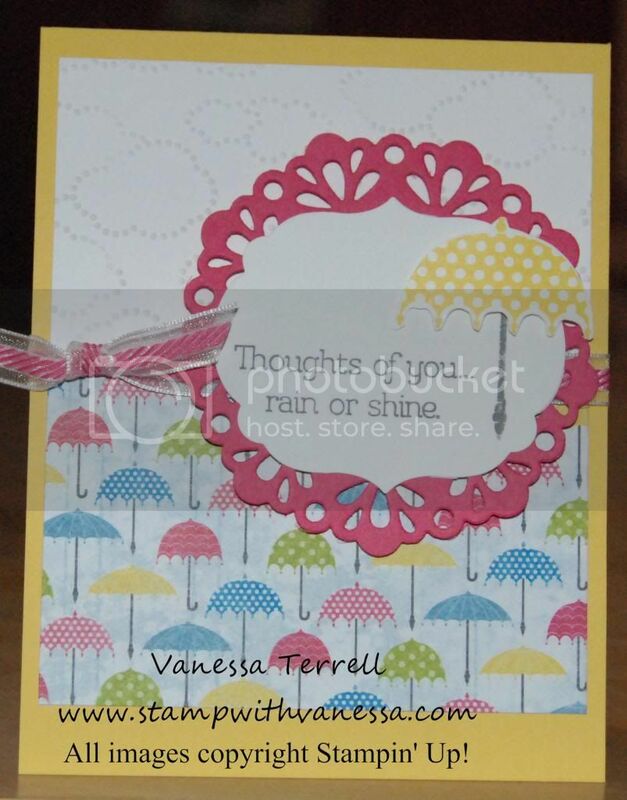 I made a thinking of you type card and used the Rain or Shine stamp set from the Spring catalog and of course I had to use the Sunshine & Sprinkles Designer Series Paper and my Big Shot. Using the Sunshine & Sprinkles DSP meant the rest of my card had to have bright colors...well that was just fine by me...you know I like the bright colors and the last few days have been cloudy weather wise...so maybe making this card will cheer me up! I also used the Cloudy Day Textured Impressions Embossing Folder. Here's the finished card!